When it comes to innovation in the delivery space, nobody comes even remotely close to UPS. The iconic courier company has figured out several different ways to increase the fuel efficiency of its vehicles, while simultaneously lowering delivery times. For example, did you know that UPS routes drivers using the least-possible left turns? It sounds counterintuitive, but the move has saved 20.4 million miles, and allowed it to deliver 350,000 more packages. It’s for this reason why I’m not even remotely surprised UPS is getting into the drone delivery space, which promises to explode as the technology behind it becomes more accurate and affordable. 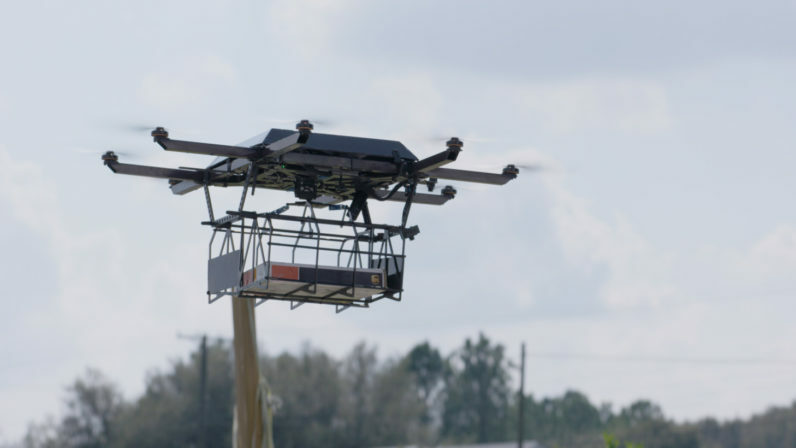 The company today announced that it had successfully tested a drone that launches from atop one of its UPS-brown delivery cars, autonomously delivers a package, and then returns to the vehicle. This happens while the driver continues to drive along a route, delivering packages. The test took place on Monday in Tampa, Florida in conjunction with the Workhorse Group. This Ohio-based manufacturer designed and built both the electric delivery truck, as well as the drone itself. The specific drone used was the Workhorse HorseFly. This ingenious octocopter boasts a cage which lowers into the truck. The driver then inserts the package, and presses a button on a touchscreen, thus sending the HorseFly on its route. While docked, the HorseFly recharges. According to UPS, this model has an endurance of 30-minutes, and can carry packages weighing up to 10 pounds (around 4.5 kilograms). UPS has performed several tests involving drones. But this is the first one designed for non-essential packages. Previous experiments saw the company stage a mock delivery of medicine from Beverly, Massachusetts to an island three-miles off the coast. In another, it partnered with a third-party organization to bring much-needed blood and vaccines to those living in rural Rwanda. The company believes that by leveraging drones, it will be able to expand the availability and quality of its delivery service to rural areas. “This test is different than anything we’ve done with drones so far. It has implications for future deliveries, especially in rural locations where our package cars often have to travel miles to make a single delivery,” explained Mark Wallace, UPS senior vice president of global engineering and sustainability.